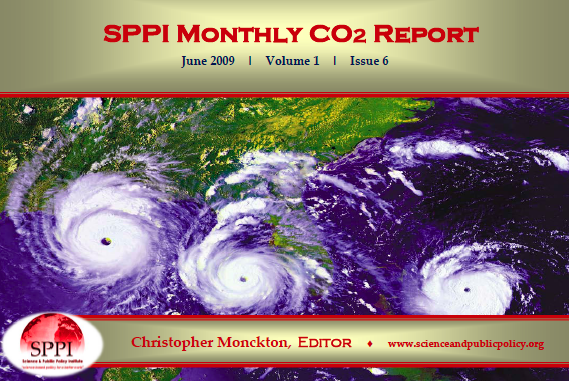 Global hurricane activity nears a 50-year low SPPI’s authoritative Monthly CO2 Report for June 2009 reveals that global hurricane activity is at a 50-year low, casting doubt on the accuracy of projections that “global warming” would lead to more intense hurricanes. These and other disasters that are said to be happening are not happening. Hurricane activity graph, page 3. It is time to close NASA down. 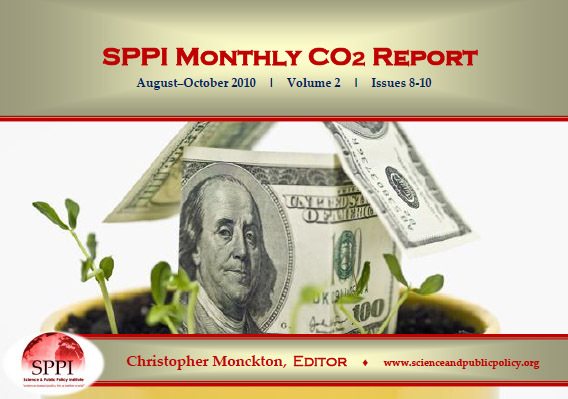 This month’s editorial comment cites yet another series of outright falsehoods uttered by one of NASA’s team of rent-seeking, fat-cat, “global warming” profiteers, and recommends that NASA be disbanded. Page 3. 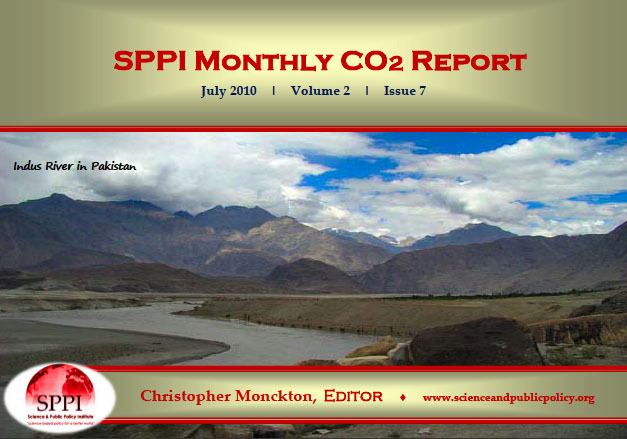 The IPCC assumes CO2 concentration will reach 836 ppmv by 2100, but, for almost eight years, CO2 concentration has headed straight for only 575 ppmv by 2100. This alone halves all of the IPCC’s temperature projections. Pages 5-6. Since 1980 temperature has risen at only 2.5 °F (1.5 °C)/century, not the 7 F° (3.9 C°) the IPCC imagines. Pages 7-8. Sea level rose just 8 inches in the 20th century and has been rising at just 1 ft/century since 1993. Sea level has scarcely risen since 2006. Also, the oceans have been cooling since 2005, raising questions about “global warming” theory. Pages 9-10. Arctic sea-ice extent is about the same as it has been at this time of year in the past decade. In the Antarctic, sea ice extent – on a 30-year rising trend – reached a record high in 2007. Global sea ice extent shows little trend for 30 years. Pages 11-13. Solar activity at last shows signs of recovery. The three-year solar minimum may at last be ending. Pages 14-15. The (very few) benefits and the (very large) costs of the Waxman/Markey Bill are illustrated at Pages 16-18. Science Focus this month studies the supposed effects of “global warming” on animals and birds. Pages 19-20. 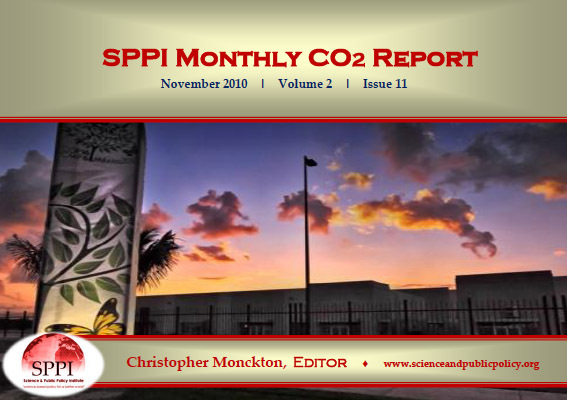 A Special Report reprises Dr. Bill Gray’s recent memo showing why “global warming” is overstated tenfold. Pages 21-27. An open letter from several eminent scientists to the US Congress sounds a strong warning against alarm. Page 28. 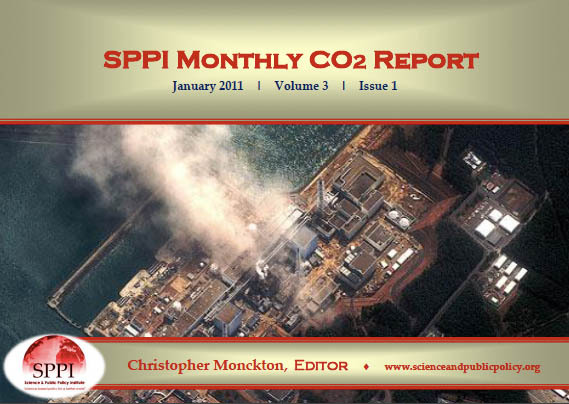 As always, there’s our “global warming” ready reckoner, and our monthly selection of scientific papers. Pages 29-33. Finally, a Technical Note explains how we compile our state-of-the-art CO2 and temperature graphs. Page 34.